The Verdict: I actually really liked this mascara it has a unique brush that you apply like a normal mascara at first and then you go over the lashes whilst rolling the brush upwards. It's supposed to add length, volume and curl. I have to say it did add length and volume but not so much a curl. However I still like it, I will just have to make sure that I use an eyelash curler beforehand. However the most impressive thing for me was that it did not smudge one bit! I wore it all night last night and tried it again this morning, no smears at all! I think purely for that reason it's worth £19.50. Any other mascara that I have used definately smudges no matter what the price tag, I have to keep checking in the mirror to wipe it off the residue. This mascara passes the test and I am seriously very impressed. I would highly advise you try it if you hate mascara that runs as this will become your new best friend. 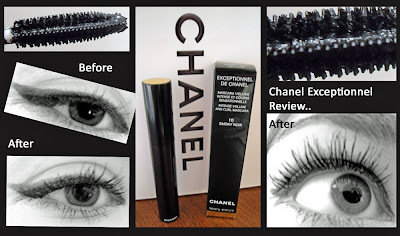 Hmmm, I'm adding this Mascara to my wish list. Great review! Might have to give this one a try! The Chanel one works wonderfully on you though! your eyelashes look so much like falsies here :). . . really looking forward to this trying this product! anyway.. I am glad it works for you, thanks for the review!!!! !